The tranquilised dog should be clipped at the head area first. He was from the gentle and polite generation that had experienced World War Two, before the baby boomers generation. That made him over seventy years old. He loved to wear the white collar-less cotton T-shirt used to be seen commonly in coffee-shop operators of his generation. Two suspenders on either side pulled up his trousers revealing cowboy boots. A lush white Fu-Manchu moustache left to grow. The eyes were shining after two eye cataracts were removed and replaced with modern lens. He wanted to be a dog groomer and transport man as that gave him freedom from being an employee tied down to office politics and bureaucracy. A dog with the thickest matted coat was his challenge for $65, quoted by him and accepted by the owner. Clumps of dead hairs solidify on the body of this cross-bred terrier. It would be too painful to clip and hand strip. I gave it a tranquiliser, "Ken, the head and neck should be clipped first as the maximal effect of the tranquiliser would be around 15 minutes after injection." As usual, he would do it his own way, just like Frank Sinatra. He was too polite to tell the vet off. He ate more salt than the young doctor who was not even born when Merdeka (Independence Day) was declared. 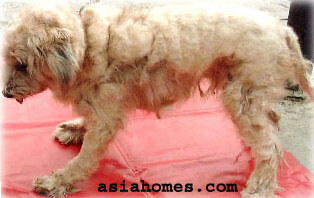 He took more than one hour, maybe two to shave the matted coat, starting from the tail first and then the body. Now, the head part. The dog raised his head. Actually, he wasn't fully asleep. It growled, showed his fangs as its face was being trimmed. Ken asked for another tranquiliser to complete his job. "No," I said. "The dog may die. I don't advise tranquilisation in a short period of time as the cumulative effect may be deadly." What should Ken do? He was now in the tiger's den. The body was clipped bald but the dog's face had an unkempt appearance of hair of various lengths. I advised that the dog be returned home and another day would be fixed for tranquilisation. Ken faced the dog, like a matador would face the charging bull. He swung the two strings of a muzzle towards the face of the growling dog hoping to hook the mouth. The dog turned his head sideways, upwards and downwards. Its pupils dilated, its lips wrinkled and trembled. It was getting angrier. The groomer flung the muzzle as if he was lassooing a horse like those cowboys in the OK Coral. His heart missed a beat or two. He missed thrice although his hands were steady and his eye sight good with the new type lens. The dog was down but not flat out. Just one opportunity and it nipped the groomer's hand with its fangs, between the thumb and fore-finger. The groomer was stoic. No scream of pain. Blood oozed out. Bright red spots stained his hand. Ken thought he would die soon. He rushed to the Emergency Ward of the Tan Tock Seng Hospital. A dressing was done. No injections or antibiotics. All for $70. $70 was a large amount for the old timer who had just started business. That was the starting fee from July 2000 for all who wanted to go the the Emergency Wards of Singapore government hospitals instead of the general practitioners who would charge less. The groomer was trying to save money by avoiding the General Practitioners who would charge $18 - $20, he said. Government polyclinic doctors charge 50% less but he did not realise that the Government had jacked up the emergency ward fees to dampen the demand. This was not the first time he had been bitten. But this was the first time he went to the Emergency Ward. The dog Owner was not paying for a job not completed. Total "loss" after a dog bite and going to visit the emergency was $145 including taxi fares. The xylazine tranquiliser had the same maximal effect around 15 minutes after injection and the head should be clipped first. Should we heed technical advices from professionals or experience "no pain, no gain?" Dog bites are painful. Do we need dog bites to gain knowledge, like this groomer? Vets and groomers must be aware that the tranquilised dog may bite.